Hand-eye coordination is essentially knowing how to "touch" the end-point of your line of sight, and hence coordinates the arm-hand movement in the brain with spatial awareness of the target location by dominant-eye directional sense plus distance or depth judgment -- so putting to the target is similar to "touching" the target. Main Idea. 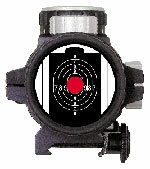 Use good sighting plus good distance judgment to localize the target as the end-point of your line of sight. This sort of targeting sharpens up your ability to make a movement AT and TO this location. 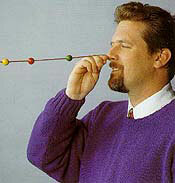 In order to integrate sensory processes to better "see" and "hit" the line and the target (and thus use enhanced hand-eye coordination to move the putterface directly at and down the real line to or towards the target), look along a line on the ground from the ball "to" the target and look all the way through the air to see "at" the target's true distance. The MATH for great putting is simply "2 + @=N". A Quick Demo. Stand in front of a mirror and look down. Then look up and find your dominant eye's pupil. As soon as you "sight" the pupil, raise your hand vigorously and point at the pupil. 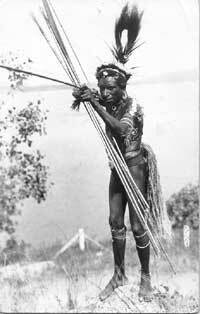 Then close your nondominant eye and visualize your line of sight as a taut string between real pupil and mirror pupil. Your fingertip ought to be just "touching" your mirror pupil from below. Repeat this exercise, this time slowly, and run your fingertip from your real pupil outward along the taut "string" that connects the two pupils and "touch" the mirror pupil. This is "touching" the end-point of your sight line. You don't really have to actually touch the object located at the end-point of vision. Use your dominant eye to sight a distant target, such as a light switch or street lamp. 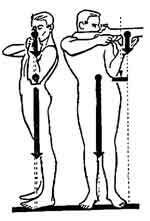 Visualize the taut string of vision, and run your fingertip outward along the line until your arm is extended and you are pointing at the target. Again, your fingertip will appear to "touch" the target from below in your field of vision. The Point. The point of this exercise is to show you that hand-eye coordination, without pointing, depends upon your ability to sense the location of the end-point of your line of sight. This sort of target "localization" depends upon accurate dominant-eye sighting for direction plus accurate distance assessment from the numerous distance cues available in the visual system (depth perception is one of about a dozen distance cues, and often not the most potent). Once the target is localized in space with this precision, you will have an easier time moving the putter squarely at the target and rolling the ball all the way to the target. Other Sports. In putting, you don't actually "point" the finger at the target. Instead, you move the putterhead at the target. So, instead of "touching" the target with your pointing finger, you should "touch" the target with the movement of the putterhead. 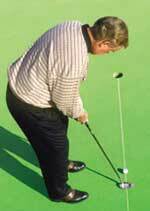 In other words, the stroke needs to be like "pointing" at the target with the stick of the putter. This can be seen in rifle shooting, fencing, and archery, where the sportsman points (in turn) the rifle, the foil, and the arrow. Vision's Line. The "line" of the direction of sight is pretty straightforward. It is the direction of gaze of the dominant eye. The dominant eye is relied upon by the brain to establish the connection to the target so that the central region of visual accuity at the back of the retina is aimed straight at the target, thus making the target appear in sharpest focus. The non-dominant eye's vision is actively ignored by the brain when this sort of sighting is engaged in. That's because the two eyes look at near objects with two different gaze directions, as when you follow your fingertip towards your nose until your eyes "cross." When getting a "bead" on a target is important to you, the brain only uses the eye that does that well, so it only has to deal with one gaze, not two. 3) the fact that objects striking the back of the two eyeballs at the matching places on each eyeball's retina constitute an arc of "zero disparity" on the "horopter" (retinal disparity) so that the relative distances among objects in view can be compared. Hence, depth perception depends upon stereoscopic (two-eyed) vision, and the brain "reads" the angles the eyes are pointed and the distance to focus and the relative directions and distances to surrounding objects. Locations / targets on the arc defined by the gaze's fixation (Mx) have matching retinal points. Locations / targets inside or beyond the arc register images on each retinal off the matching retinal points. For focusing on objects close up, the two eyes point inwardly (converge). The farther the object gets away from the face, the more the two eyes diverge until, for far-off objects, the two eyes are essentially pointing parallel. As the two eyes focus on near objects, the lenses relax and fatten up to curve the rays of light enough to make the object look right. The lens can only fatten up so much, however, and when the fingertip is inside about 10 inches for almost everyone, it is very difficult or impossible to focus. When an image is not focused, it appears doubled. A focused image "fuses" the images of the two eyes correctly so that the brain "sees" only one image from two different directions, and it seems that there is only one eye in the center of the forehead ("Cyclopean" vision and fusion). As the fingertip moves away from the face, the lenses tighten to a flatter shape to keep the tip in focus. The changes of the lenses is done by the stretching of muscles arrayed like trampoline springs around the edge of the lens, and these muscles signal the brain about the seeming distance of the object when the image appears fused. In my experience, when the dominant eye is relied up for sighting a target, and the golfer looks "at" and not simply "towards" the end-point of interest, the slight flaws in the vergence system are not a source of significant error. Good visual focus and attention with the dominant eye does not involve two-eyed vergence. It is only when the golfer is not careful to use strong dominant eye sighting, or is not able to do so, that the vergence can be a problem. Even so, depth perception of the surface at various distances is very important to reading surface contour and hence "break." The chief benefit of LASIK eye surgery is not that it helps sighting a target, but that it helps seeing the surface more vividly and accurately. So vergence flaws can still be a problem worth fixing. How to Point with the Putter. In the visual field of the dominant eye when you look down at the putterhead at address, the focus on the gap between the ball and the putterface establishes a starting point (A). The end point is the target (B). If you look from the gap to the target by turning the head and/or eyes, there are many, many combinations of head move and eye move to get from A to B. 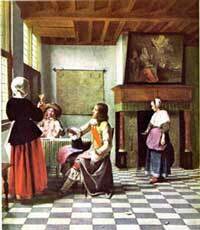 And the reulting head-gaze relation is what shapes the dominant eye's field of view and locates the target in that field of view. Looking from A to B with the least complicated combination - the simplest combination of head and eye movements - generates the clearest and most accurate sense of the end point's location in space. The simplest combination is 1) no gaze changes, and b) a head turn that stays in one plane of rotation throughout. This requires a gaze that starts and stays straight ahead out of the face, looking into the field of view through only one "aim spot." Together, a straight gaze and an in-plane head turn both require that the horizon line across the dominant eye matches visually with the startline of the putt, so the eyeline will also be perpendicular of square to the putterface at address. 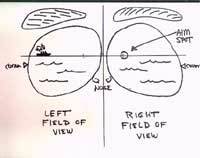 "Aim point" of dominant eye plus "Horizon line" across visual field of both eyes. Use this "aim spot" to make your eyes' "horizon line" match the startline of the putt along the ground and then turn this "plane of vision" without twisting out of plane to the target, and center the end-point of vision on the target -- that is, "draw a bead on the target." This way, an in-plane head turn gives clear signals about distance and draws the end-point of vision in a straight line along the ground from A to B, AND in the final view of the target, the target is centered on the "aim spot." While still looking at the target, you "point" the putter to "touch" the end-point or the target so that the putterhead's sweetspot is now your fingertip. The sweetspot of the putterhead, in the field of view of the dominant eye, will appear to "touch" the target. Touching and Follow-thru Stroke Length. 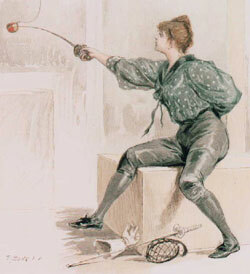 It is not necessary to move the putterhead all the way along until it appears to touch the target, and this should not be done, since it will introduce artificiality in your stroke. Instead, just point "along at" the target for whatever distance your well-tempoed stroke goes in the follow-thru and let that be enough. The essence of the pointing is moving the putterhead straight along the sighted line "as if" you were going all the way to touch it. Doing this is equivalent to moving the putterhead along a chalkline, or pointing a wand along the line ending by pointing at the target. Eyes' "horizon line" in the field of view matches a "chalkline" for the putt. Make This Part of Your Game. Set up to a straight 3-foot putt, use a straight-ahead gaze to locate the target, and then point at and visually touch the target with the putter's sweetspot. Try sinking a few balls to sense pointing the sweetspot down this line. Do this while still looking at the target. Pay attention to the feeling of the movement of shoulders and arms. Now look back to the ball, and repeat the pointing to the target with the putterhead while keeping the head still and the gaze directed at the ball. Next set up to the ball and move the putter's sweetspot until it visually touches the front lip of the hole where you expect the ball to cross over. Now, keeping the putterface square to this line into the hole, sweep the putterhead back along the line and place the putterface behind the ball, keeping this square orientation. Now touch the hole with the stroke. Finally, set up at the ball and use your left / lead hand to point at the target to locate it accurately, seeing your fingertip touch the "aim spot" in your field of vision as you "aim" your dominant eye right at the target. Let your pointing finger drop smoothly back in a straight line to point at the ball. This is the line for the putterhead to move. 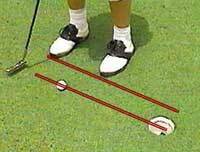 The putterhead's line of motion is not the same as that of the lead hand, but is offset parallel. The hands move in a line at a point to the inside of the target offset the same distance the hands are back inside the putterhead's sweetspot. The movement of the hands and the movement of the putterhead are parallel, but the putterhead stays moving along the direct line from A to B, while the hands move parallel left. So don't get confused by the "pointing" metaphor into thinking it is the hand that you are pointing with -- it's not, it's the putter's sweetspot. Hands move parallel left, putter points straight down the line at the target. On the course, once you've read the putt and set up squarely aimed to a distant target, use this sense of visually locating the target at the end-point of your line of sight and then point the putterhead down the line as if to "touch" the target for sharper putting.